Everyone has strengths. Let us help you identify yours and show you how to use them to achieve your fullest potential. 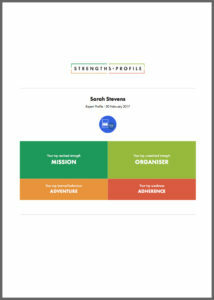 The Strengths Profile is an exceptionally productive and comprehensive online assessment tool for individual executive, personal and team coaching, as well as student development and career planning. The survey has 180 questions and takes about 20 minutes to complete. Coupled with a Strength Catalyst Partners Strengths Assessment, your results will help you gain a unique, insightful understanding of your realised strengths, learned behaviors, weaknesses, and unrealised strengths. 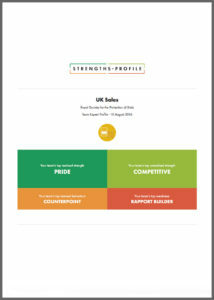 There are 60 distinct strengths in this tool, enabling your results to be presented in a very granular way. Your strengths of Being are those that describe the essence of how you exist in the world. For example, you might be Centered, Curious or Mission-driven. Your Communicating strengths describe how you give and receive information. For example, are you an Explainer? A Listener? Someone who relishes the Spotlight? Your Motivating strengths describe your drive toward action. Are you predisposed to Action? Adventure? Change? Competion? Your Relating strengths describe how you to relate to others. You might be a Connector, an Esteem Builder or a Relationship Deepener. Your Thinking strengths describe your approach to situations. Are you Innovative? Optimistic? Planful? A Strengths Assessment is a custom debrief session of 60-90 minutes where we can recommend simple ways that you can make the Strengths Profile learning actionable for the achievement of your short and long-term professional and personal goals. Whether you are a working professional, student, retiree or stay-at-home parent — everyone can significantly benefit from increased self-awareness. What’s more, it’s a very interesting and enjoyable experience.